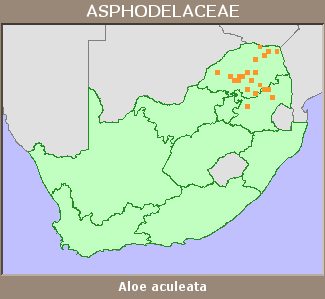 Widespread in Limpopo Province and the Sekhukhuneland region of far northern Mpumalanga. Also occurs in Zimbabwe. 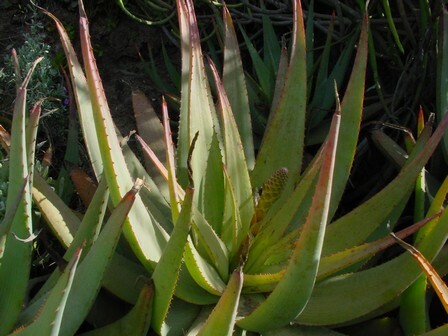 Stony slopes in hot semi-arid areas, in grassland or open bushveld. This species is not threatened (Van Wyk and Smith 1996). In some areas locally very common, such as between Burgersfort and Penge on the Limpopo-Mpumalanga border, the Olifants River Valley, the foothills of the Strydpoort Mountains, the Wolkberg and the Soutpansberg (Van Wyk and Smith 1996, Reynolds 1969). Protected in the Kruger National Park (Punda Maria area). A. aculeata was depicted on the South African 10c piece from 1965-1989 (Glen and Hardy 2000).